Jonathan Rea on his Kawasaki Ninja ZX-10RR at Portimao in Portugal. World Superbike champion Jonathan Rea has completed a productive two-day test at Portimao in Portugal ahead of the fourth round of the championship later this month at Assen. Rea has started his 2017 bid to become the first rider ever to win the title three years in succession in spectacular style, taking five wins and a runner-up finish from six races on the Kawasaki Ninja ZX-10RR. He has opened a lead of 50 points over Welsh rider Chaz Davies on the Aruba.it Ducati and is right on track to make history this year. The 30-year-old completed two race simulations at Portimao, where the 10th round of the championship will be held in September. “It has been really nice to test here in Portimao, especially to continue on from our positive test in Aragon. We worked in a calm and methodical way,” Rea said. “The track was really dirty and because there were only a few bikes on track we never had perfect conditions on the ground. In saying that, the weather has been amazing and we were able to make a lot of laps, analysing some new parts. “We also made a good step forward with our chassis set up, improving that in some key areas. We were able to draw some positive conclusions from doing two full race simulations, when my pace was strong,” added the double world champion. “I also did a lot of practice starts and now I feel a bit more consistent in that area. After we ticked all the items off the list of work we had to do I used a ‘Q’ tyre and we were able to make a really fast lap. “I’m really thankful to Kawasaki and all the staff for making this test happen. Round four of the series at the legendary Assen circuit takes place from April 28-30. 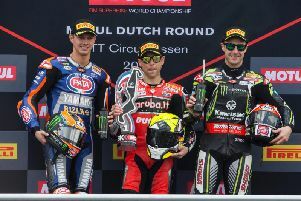 Rea boasts a formidable record at the Dutch circuit, where he has won the last five World Superbike races. In the most recent round at Motorland Aragon, he capitalised when Davies crashed out to bag all 25 points, stretching his title lead. Davies hit back to win race two, when Rea finished second.